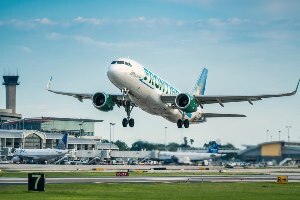 (August 8, 2018) Frontier Airlines today announced it will launch seasonal service from Tampa International Airport to six new cities this winter: Grand Rapids, Michigan; Syracuse, N.Y.; Greenville/Spartanburg, S.C.; Charlotte, N.C.; Portland, Maine; and Norfolk, Virginia. The addition of these destinations includes service to four new markets for TPA – Portland, Norfolk, Greenville/Spartanburg and Syracuse – and brings the total number of TPA’s Frontier flights to 19, solidifying Frontier’s position as the fastest-growing airline at the Airport. In the past two years, the airline has more than doubled its TPA passengers from 438,131 to more than 1 million annual passengers. It has also more than quadrupled its number of flights, from six during the summer of 2016 to this year’s 19, which include the airline’s seasonal flights that will launch in November. The biggest jump has taken place over the last year, which saw an 83 percent increase in Frontier passengers flying through TPA. Frontier flies one of the youngest fleets in the industry, the Airbus A320 family of nearly 80 jet aircraft with plans to purchase 200 more, and is known for its affordable fares. Celebratory introductory fares for the new seasonal TPA flights will start as low as $29. To book a flight on Frontier, visit www.flyfrontier.com. Depart TPA: 6:23 a.m. Arrive CLT: 8:13 a.m. Depart CLT: 9:03 a.m. Arrive TPA: 10:48 a.m. Depart TPA: 10:50 a.m. Arrive GRR: 1:35 p.m. Depart GRR: 2:35 p.m. Arrive TPA: 5:25 p.m. Depart TPA: 7:05 a.m. Arrive GSP: 8:45 a.m. Depart GSP 9:35 a.m. Arrive TPA: 11:20 a.m. Depart TPA: 6:08 a.m. Arrive PWM: 9:14 a.m. Depart PWM: 10:05 a.m. Arrive TPA: 1:35 p.m. Depart TPA: 2:25 p.m. Arrive SYR: 5:04 p.m. Depart SYR: 5:55 p.m. Arrive TPA: 9:04 p.m. Depart TPA: 6:23 a.m. Arrive ORF: 8:19 a.m. Depart ORF: 9:09 a.m. Arrive TPA: 11:15 a.m.